We currently have 17 puppies in our kitchen. And yes, we're officially crazy. That said, this little guy is sorta extra special cause he gets to stay here and become our next stud dog. I am so in love with him.....he has the biggest, chunkiest head and he's going to be huge! Oh my goodness! He already looks like a big, manly guy when he's still a little puppy. :) He'll be gorgeous, and a wonderful addition to your pack. What a handsome stud dog! I can't wait to see the puppies he sires. I'll think about names...can't wait to see what you eventually decide on! I love him! You would LOVE him in real life, Emily.....you'll have to come see him :) I can't wait to see his future puppies, either!!! Yes, 17.....God knew what He was doing when He gave us a big kitchen!!! 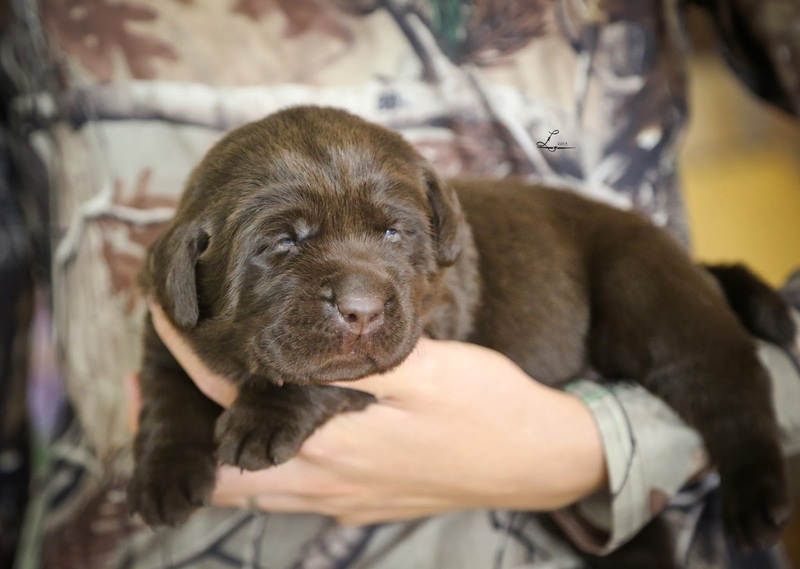 I LOVE the name Ruger, but we have a horse named Ruger, and know at least 2 other dogs with that name ;) Right now, we're debating between Remington (and calling him Remi) and Caliber (and calling him Cal). What name did you guys decide on? Crazily enough.........we haven't! I know, I know...it's awful! I like that! So are you planning to teach him to hunt?